After Hurricane Matthew in 2016, a group of engineers from the Town of Chapel Hill inspected the just installed InfraSteel steel slip liners and were pleased with the performance of the rehabilitated culvert. Before the hurricane, the town had installed the culvert rehabilitation solution after the North Carolina Department of Transportation discovered three large failing corrugated metal plate arches under nearby Elliott Road on the heavily traveled US Highway 501. InfraSteel’s cost-effective and environmentally friendly culvert rehabilitation solutions. Chapel Hill engineers inspected the just installed InfraSteel slip liner and were pleased with the performance of the rehabilitated structure, which has a new life expectancy of 75 to 100 years. After Hurricane Matthew in 2016, a group of engineers from the Town of Chapel Hill inspected the just installed InfraSteel steel slip liners and were pleased with the performance of the rehabilitated culvert. Before the hurricane, the town had installed the culvert rehabilitation solution after the North Carolina Department of Transportation discovered three large failing corrugated metal plate arches under nearby Elliott Road on the heavily traveled US Highway 501. The 190” x 120 inch” corrugated metal arch culvert was near structural failure and needed immediate repair. The Town of Chapel Hill is the home of the University of North Carolina. The college town is sensitive to the environmental impact of construction projects. Elliott Road has a traffic count of 7,000 vehicles per day and Booker Creek is prone to flooding. The city hired Hydrostructures, of Pittsboro, North Carolina, to determine the best solution to repair the failing culverts. Hydrostructures determined rehabilitating the existing culvert structure was the best solution. 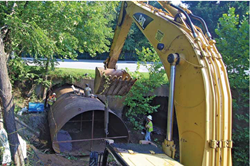 They started looking for a culvert rehabilitations solution that had low environmental impact, maximized hydraulic capacity, improved structural integrity and avoided traffic disruption. Based on this criteria, Hydrostructures chose InfraSteel from Precision Pipe and Products in January, 2016. Curtis Contracting of West Point, Virginia, performed the work. Load bearing calculations were done to determine the wall thickness, and InfraSteel contacted its manufacturing plant to start slip liner production immediately. Curtis Contracting began the project in July of 2016. Once the steel liners were in place and the welding was completed, the annular space between the liner and the existing corrugated metal pipe was grouted by pumping grout around the steel structure to ensure that all gaps were filled. The project was completed for $736,830 and was finished in 90 days without any traffic interruption. Millions of culverts in the U.S. have already exceeded their design life. Although each culvert location is different due to its unique conditions, over time corrugated metal pipe culverts are attacked by abrasion and corrosion until failure is inevitable. For more information about InfraSteel’s cost-effective and environmentally friendly culvert rehabilitation solutions, contact Cullom Walker at (205) 613-0072. The Chapel Hill Project was featured in an article in the Trenchless Technology magazine. For a copy of the article, please click here.